You hear it every election. Endless talk about the need to create jobs, build the economy, make the nation a “better place to live for our families,” and, my favorite – “restore trust!” Who’s not for those wonderful things! The slogans work for Democrat and Republican alike. These so-called issues are interchangeable. They are, in fact, nothing more than empty rhetoric. So, our political parties choose for us candidates that are “acceptable,” middle of the road, not rocking the boat, and not too extreme. In short, we are forced to choose the lesser of two evils. Election after election the drone goes on. And what are we to do? These are the candidates those in charge have chosen for us for city council, county commission, state legislature, Congress and President. Yes, we have primaries to choose, but I think we all know those are pretty much rigged to assure the powers in charge get whom they want – just ask Bernie Sanders. Is it any wonder that there are millions of Americans who don’t vote or participate in our nation’s debate because they think it doesn’t matter anyway? The “average voter” increasingly feels that the decisions have been made for them. The poor think they are simply pawns in a vice grip between big money and special interests which control the elections. Why bother? Helplessness now rules the world’s greatest representative democracy. As people stay home or trudge to the polls to unenthusiastically vote for the next lesser of two evils, 93% of incumbents are routinely returned to office – year after year after year. The instant a candidate is elected and joins the ranks of the incumbents he/she begins the dance. Get the money for the next campaign. How? Special interest groups, corporations and foreign interests flood into their offices to make deals, promote their personal agendas and show the way to fame, fortune and perpetual office – if only the incumbents go along. They have the whole process well in hand. Campaigns become little more than big PR projects, promoted in positive platitudes, specifically designed to assure nothing negative sticks. Just get through it and keep the gravy train running. So, year after year, we officially hold elections and politicians pontificate about how our going to the polls is a revered right, a valued tradition, the underpinning of a free society. And they wonder why there is such division in the nation. How did we end up in such a mess? We voted for these guys. But did we enjoy it? Are we satisfied with the results? Would we like to demand a do-over? So, is it hopeless? Is there any way to change it? Do you want the people to, again, have control of the election process and of the choice of candidates offered? Do you want to force the power elites to listen to you? I’ve got a solution. Don’t despair. Don’t give up. There is a logical, effective way out of this. But it won’t happen by depending on political parties to lead the way. We have to take things into our own hands. We need an effective, binding form of protest to say “NO” to bad candidates. There is such a way. Imagine going into the voting booth and looking down the list of candidates offered. None really appeal. None seem to offer satisfaction as an answer to the issues that concern you. If only there was something else you could do. A write in won’t help. It would take such a difficult, expensive effort. It rarely works. Then you look further down the ballot. Something new. 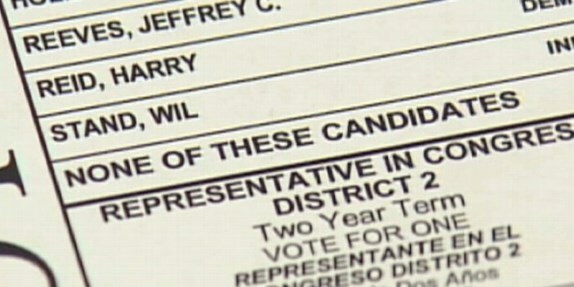 It says “NONE OF THE ABOVE.” It’s a final choice after each of the candidates in every category, from president, to congress to city council. What does it mean? It means you have the power to decide who will hold office – not the power brokers. When the votes are tallied, if “NONE OF THE ABOVE” gets a majority of votes over any of the candidates listed, then “NONE OF THE ABOVE” wins. And that means none of those candidates will win the office. The office will remain vacant until a new election is held. To set up another election and fill the spot would work exactly like the process provided in the Constitution when an incumbent dies or resigns, and a special election is held. Now new candidates will have to try to win the public’s support. Fixing the election process could be that simple. You, the voter, would be completely in the driver’s seat with the power to reject candidates, forcing a new election with new choices. The political parties would be forced to provide candidates the people want -- or face being rejected. They would have to talk about real issues – or face being rejected. Incumbents would have to answer for their actions in office – or face being rejected. “NONE OF THE ABOVE.” Period. The power of labor unions and international corporations would be broken. However, in order to work, “NONE OF THE ABOVE” would have to be binding. It would have to have the power of law behind it. It cannot be just a “protest” vote that has no other meaning. “NONE OF THE ABOVE” is completely non-partisan. There is no way to control its outcome. There is no need for a massive campaign chest to support “NONE OF THE ABOVE,” although it could certainly be done. But the option, once permanently placed on the ballot, would always be there. America’s representative system would be restored. To get the job done, activists in every state would have to begin a campaign to demand that “NONE OF THE ABOVE” be given a permanent spot on the ballot. It would not require a Constitutional Amendment. It would have to be done state by state. Some states have ballot referendums and initiatives using petition drives to get an issue on the ballot so the people can decide. It’s difficult and expensive to do, but popular ideas have a chance. In other states, “NONE OF THE ABOVE” advocates would have to find a friendly state representative or senator to introduce the idea before the state legislature and then get enough votes to pass it in both houses and then have it signed by the governor. The main drawback to that effort is that, if the effort is successful, then every one of those legislators is an incumbent who will have to face “NONE OF THE ABOVE” on the ballot for their re-election. They probably won’t be too excited about the idea. So why would they support the idea? It would be only because supporters succeed in creating a strong movement of voters which demand it. No one is saying this will be an easy process. But such movements have succeeded before. For example, local activists could begin by demanding that candidates support the measure much like they now sign “no tax” pledges. In short, they would support it because there is strong popular support and they simply have no choice. Of course, one of their main objections to the “NONE OF THE ABOVE” idea would be the requirement for holding a new election, should it win. Too expensive, our responsible public servants would say as they dismissed the idea. However, if it means getting better candidates, isn’t it worth it to hold a new election, especially considering how much a very bad candidate would cost us if he actually got into office? The fact is, such a need for a new election would probably not arise often once political power brokers began to understand that they must offer candidates acceptable to the people rather than to the special interests. That’s all they really have to do. It’s all we want. It only takes a couple of "None of the Above" victories to see that the electorate is back in charge. The idea of “NONE OF THE ABOVE” has been around for a long time. Over the years, most states have had some kind of legislation introduced supporting the concept. Nevada actually has it on the ballot – but it is not binding. It doesn’t force a new election. It is just a measure of protest. That’s not good enough to make it effective. The best part is that “NONE OF THE ABOVE” isn’t a conservative or liberal idea. It’s not a Republican of Democrat proposal. In fact, Republican leadership might see it as a good way to break the back of big labor’s influence over elections. Equally, Democrats could see it as a way to stop the power and influence of the Republican’s big business money. However, the parties want to look at it, the bottom line is that the voters win. Submitted by J.D. Grimes on Fri, 05/19/2017 - 18:07. This is an interesting idea, and similar to the idea of allowing voters to weight each candidate as first, second, or third choice. Both ideas are intriguing, but I would be dubious that "NONE OF THE ABOVE" would be very effective. The issue would be that the candidates would have big money to turn out voters, but who is going to put up the big money to turn out dissatisfied voters to support "NONE OF THE ABOVE"? It is really little different from having third parties on the ballot: people are usually scared to vote for them, for fear of giving the other party the advantage. I don't see how this particular aspect is addressed by "NONE OF THE ABOVE". That is the benefit of the "first, second, third choice" approach, because you can vote for a third party while also voting for a major party. There is no longer a fear that tossing your vote away from a major party candidate is going to be throwing it away, and give the other major party the victory.